Good day, princesses! I have another Laquerlicous creation to share with you today. Behold the glossy, glittery beauty that is Sapphire Glaze! I love this polish! It's so gorgeous! In the shop it carries this description: "This polish is in a deep blue base with blue, teal and magenta micro glitter." That is very accurate. You can tell there is more than one shade of blue glitter, and the magenta glitters give it a little something special. The deep blue base often makes the magenta glitter look like a deep purple on the nail, which is awesome in my opinion! Looking at the polish in the bottle I thought "well, it's a dark jelly, but I wouldn't be surprised if it took 3 coats by itself". Not so! It covers very well and I had no issues with visible nail line or bald spots on my nail. Despite being packed with glitter the glitter is very easy to work with and spreads evenly. It does have some texture by itself but it smoothed right out with topcoat, which added to the shiny jewel effect. This polish is perfect for princesses who love royal blues and/or having their tips sparkle like gems! You can find Sapphire Glaze (and a range of other jewel-themed "glaze" polishes) at the Laquerlicious shop. 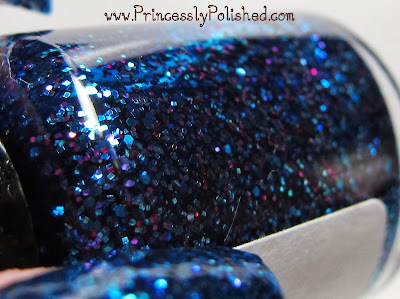 My thanks to Michelle for sending me this polish to share with everyone on my blog!